"This popular supplement for dogs is made with six active ingredients including glucosamine, chondroitin, MSM, yucca schidigera, CoQ10, and hyaluronic acid." "Pet parents find that these liver-flavored supplements are appealing even to picky dogs." "The GlycoFlex 3 glucosamine chews from VetriScience are bite-size treats formulated with the needs of pint-sized pets in mind." "Instead of giving multiple tablets or chews to reach the right dosage for your large breed dog, just give one tablet of Dasuquin to your dog per day ..."
"This glucosamine powder is cold-processed to preserve nutritional value and it also includes a superfood blend to support digestive health ..."
"This ultra-concentrated formula delivers 1600 mg of glucosamine per ounce." "While individual results vary, many pet owners report that this food has made a significant difference in the ability of their dog to move comfortably." "This natural supplement contains the common lineup of glucosamine, chondroitin, and MSM, but also adds hemp oil and turmeric..."
If you’re looking for a reliable way to give your four-legged friend a daily dose of glucosamine, the Doggie Dailies Glucosamine for Dogs supplement is our top choice. This popular supplement for dogs is made with six active ingredients including glucosamine, chondroitin, MSM, yucca schidigera, CoQ10, and hyaluronic acid. While it looks like a treat, each soft chew delivers 100 mg of glucosamine, in addition to the other joint-friendly ingredients just mentioned. Doggie Dailies Glucosamine for Dogs are made in the USA using cold-press extrusion to maximize the nutritional value of the ingredients. This glucosamine supplement has earned thousands of paws-approved reviews for the taste and good effects that come from these chews. What sets this formula apart is the fact that so many beneficial active ingredients can be easily administered to your dog in one chew – though you may need to give multiple chews to achieve the recommended dose of glucosamine for your dog’s weight. Keeping your furry friend in top shape doesn’t have to cost a bundle with this budget glucosamine supplement for dogs. PetNC Natural Care Hip & Joint Soft Chews are affordable and pet-approved. After the loading period, a container should last anywhere from 1 to 6 months — depending on the weight of your dog according to the dosage information. The chews themselves are packed with 250 mg of Glucosamine, paired with Chondroitin and MSM to round out a healthy joint supplement. Pet parents find that these liver-flavored supplements are appealing even to picky dogs. And despite being inexpensive, these treats are manufactured in the USA. If you’re looking for a glucosamine supplement in a small size for more petite canines, the GlycoFlex 3 Hip and Joint Supplement from VetriScience is a top choice. A study conducted by the manufacturer found that these supplements increased hind leg strength up to 41 percent over a 4-week period. One size doesn’t necessarily fit all when it comes to glucosamine supplements for dogs. Small breed dogs have different caloric needs and body structures than larger breeds. The GlycoFlex 3 glucosamine chews from VetriScience are bite-size treats formulated with the needs of pint-sized pets in mind. Instead of having to wait a day in between administering this supplement like you might have to with some other formulas, the GlycoFlex3 delivers just the right amount of glucosamine, MSM, and chondroitin for your small pooch in a convenient daily dose. It also adds nutrients from the green-lipped mussel to support joints and cartilage. While most dogs are happy to gobble up these ‘treats,’ a few picky eaters have turned their noses up to these. Success in administering this supplement may depend on your dog’s taste buds. For a large breed dog, you need a larger dose of glucosamine to support joint health. Nutramax Dasuquin is a popular choice with easy dosing for large dogs. Dasuquin is formulated with glucosamine and chondroitin, and also adds avocado/soybean unsaponifiable powder (known as ASU) that is believed to prevent cartilage erosion. Pet parents seem to prefer the tablet form of Dasuquin to the treat-like chews also made by Nutramax. The chews are often found to be dried out and hard, while the tablets maintain their consistency and have longer shelf stability. Each tablet of Dasuquin for Large Dogs contains 900 mg of glucosamine — which is more than double the amount of glucosamine in some other supplements for all breeds of dogs. Instead of giving multiple tablets or chews to reach the right dosage for your large breed dog, just give one tablet of Dasuquin to your dog per day (unless your vet recommends more or you’re in a loading period). A glucosamine powder can easily be mixed into your dog’s food for extra joint support. The Missing Link Ultimate Hip & Joint Formula is a popular choice. This glucosamine powder is cold-processed to preserve nutritional value and it also includes a superfood blend to support digestive health in your dog. However, you’ll need to read the ingredient label carefully if your dog has food allergies. 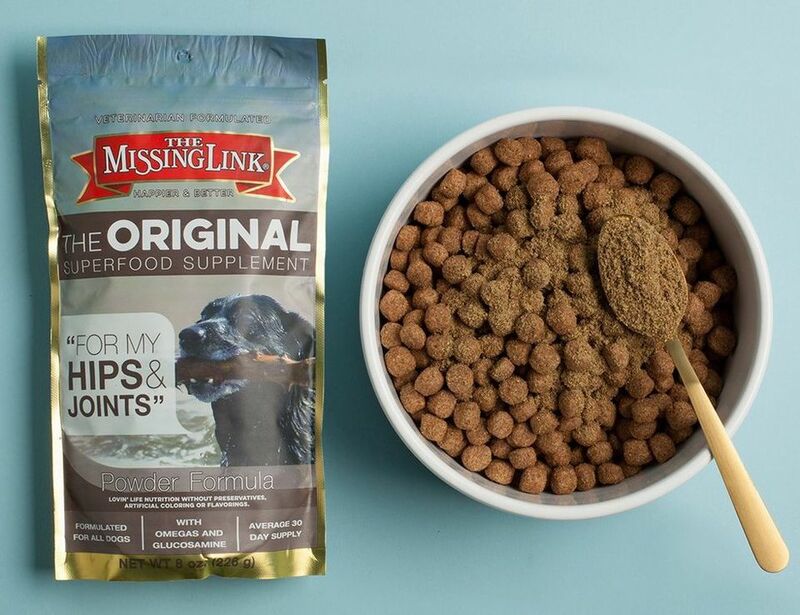 Otherwise, the Missing Link glucosamine supplement is excellent for giving your dog a supplement that will support joint health, energy levels, a healthy coat, and soft tissues and muscles. A perk is that this formula doesn’t use any artificial colors, flavors, or preservatives — but it also needs to be refrigerated. So make room for the 1 pound bag in your fridge, or clear extra space if you order the value-sized 5 pound bag. Sometimes it’s easier to add a liquid glucosamine supplement to your dog’s food or water. The TerraMax Pro Hip & Joint Supplement makes it easy to ensure your dog large or small is getting the right support for their joints. This ultra-concentrated formula delivers 1600 mg of glucosamine per ounce. Of course, not every dog will take an ounce per day, per the dosage instructions. But the formula is definitely high-powered and pet owners report excellent results from using this product. In addition to glucosamine, your four-legged friend will also get chondroitin and MSM in each dose. Liquid glucosamine is convenient because you can either put it in your dog’s water bowl each day or mix it in with their food at meal times. The product is free of sugar, salt, wheat, corn, milk, and other common allergy triggers. Dogs seem to love the taste, and some won’t even eat their dinner until TerraMax Pro Hip & Joint supplement has been added to their food. This liquid glucosamine supplement is made in the USA and is a winner thanks to its versatile method of giving it to your dog combined with its concentrated ingredient levels. Some pet owners have opted to switch their canines to a dog food that supports joint health. Hill’s Science Diet Healthy Mobility formula is a popular dog food with glucosamine. The Healthy Mobility recipe from Hill’s Science Diet includes glucosamine and chondroitin inside each crunchy kibble. This dog food with glucosamine also earns major points for being available in both large and small breed varieties. It is on the more expensive side for a dog food, but it may eliminate the need to purchase a separate glucosamine supplement for your pet. While individual results vary, many pet owners report that this food has made a significant difference in the ability of their dog to move around comfortably. Some people give this food as a single source of glucosamine, while others pair it with additional supplements. Either way, you can have peace of mind that your four-legged friend is getting a daily dose of glucosamine with Hill’s Science Diet Healthy Mobility dog food. If you’re looking for a natural glucosamine supplement, Veterinary Naturals Hemp & Hips Soft Chews are packed with nature’s remedies for joint issues. This natural supplement contains the common lineup of glucosamine, chondroitin, and MSM, but also adds hemp oil and turmeric for additional anti-inflammatory support. The formula also stands out thanks to the 450 mg of glucosamine packed into each chew. The Hemp & Hips Soft Chews are made in the USA in an FDA-approved facility and omit wheat, corn, and soy ingredients. Most dogs seem to like the taste, and there are even a variety of flavors available. After giving this natural glucosamine supplement, many dogs experienced relief from arthritis or injury-related stiffness.